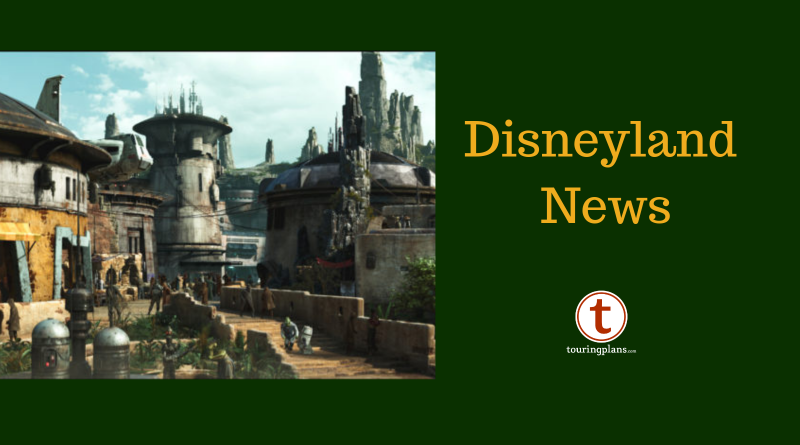 Another Star Wars:Galaxy’s Edge update, and the Disney California Adventure Food & Wine Festival and Get Your Ears on Celebration continue! Read on to find out about this and more in this week’s Disneyland news. 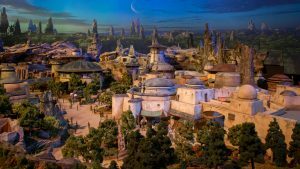 Several members of the press were recently given a preview of the new Star Wars:Galaxy’s Edge area at Disneyland, and the reviews so far have been gushing. Len Testa and Jim Hill recently hosted travel writer Carlye Wisel on an episode of the Disney Dish podcast (iTunes – Bandcamp) to talk about her visit, and it gave me goosebumps listening to her describe everything. There’s ample other coverage out there, too, just search, but because I enjoy hearing non-Disney media’s take on Disney projects, I can also recommend the review from Gizmodo’s io9. We’ll continue to keep you posted on new developments as they occur. The most significant thing happening at Disneyland Resort right now is the Disney California Adventure Food & Wine Festival, which is running through April 23, 2019. The annual event includes culinary demonstrations and seminars as well as food kiosks featuring small bites and tastes, and is definitely worth a visit. There are several special events that take place during this event as well, including wine tastings, seminars, and special meals. For more details and information on how to make reservations (which are recommended), please check here. As per usual, the Annual Passholder corner will be passing out commemorative buttons and have special photo opportunities for Passholders. Finally, Disneyland is continuing its Get Your Ears On Celebration, commemorating 90 years of Mickey and Minnie Mouse. Keep your eyes open for special menu selections, treats, character greetings, entertainment, and merchandise throughout the resort. Make sure you check out Rikki’s preview and Guy’s rundown of the best snacks for more details on what to expect! 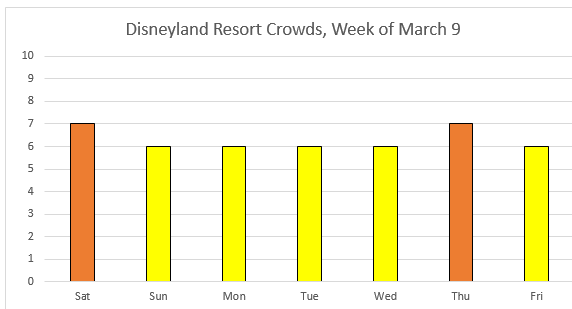 Crowds should be consistently at the medium-high level throughout the week as we kick off the early part of Spring Break season. Full details, including park-by-park crowd levels, are available on our Crowd Calendar. 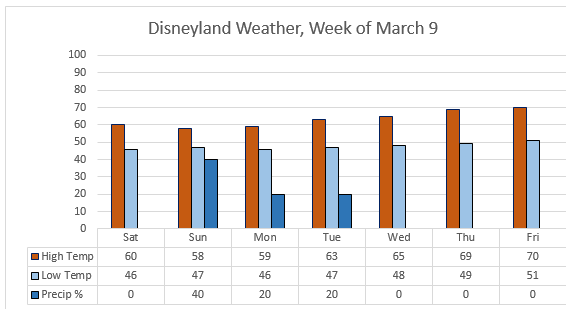 It’s looking like another relatively chilly week in Anaheim, with it warming up more as the week continues. Look out for a chance of rain from Sunday through Tuesday. As always, it’s wise to double check the weather as the day of your visit approaches. Check out the most up-to-date forecast here. Mickey’s Mix Magic, Mickey’s Soundsational Parade, and World of Color will be shown every night, and Fantasmic! will be shown only on the weekends. Detailed show schedules, including smaller diversions like The Dapper Dans, can be found here. Southern California and Southern California Select Passholders are blocked out on Saturday, with Select Passholders also blocked out on Sunday and Friday. For those of you buying tickets as day guests, single-day tickets are Regular Price ($129/$122) all week. For early admission, the parks will open one hour early for eligible guests at Disneyland Park Saturday, Tuesday, and Thursday, and at Disney California Adventure Sunday, Monday, Wednesday, and Friday. Resort guests can take advantage of these hours every day of their stay for Extra Magic Hours, while guests eligible for Magic Mornings can use that benefit one day at Disneyland Park only. Full park hours can be found by clicking on each date in the Crowd Calendar. At Disneyland Park, Astro Orbiter and the Sleeping Beauty Castle Walkthrough are offline for extended refurbishments, and Space Mountain is offline through March 15. Over at California Adventure, Grizzly River Run is undergoing its annual cool-weather refurbishment through March 29. The Silly Symphony Swings are likewise offline indefinitely — we’ll let you know when we have a projected end date. As always, be aware that refurbishments can pop up unexpectedly, so check out our refurbishments page to make sure your favorite ride is still running, and for details on exactly what will be down and for how long. That should do it for this week’s news. Check back next week and every week to find out what’s coming down the pike. Got questions? Aware of anything else that prospective guests should know about? Let us know in the comments. When not planning for or traveling to Walt Disney World with his beautiful wife and impossibly adorable daughter, James practices law in St. Louis. He also really likes cheese -- and loathes kale. He can be found on twitter at @jrtoastyman. Don’t neglect the guys starting out when your green bar starts increase. So the chances of climbing up the rankings to the top does seem to be very low.